It's not even the end of September and I've met my RIP XII goal. Yay, me! I finished World of Trouble by Ben Winters, and watched a not-quite-horror movie The Silenced. 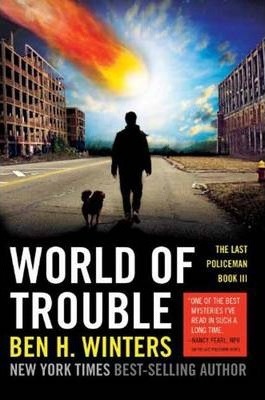 World of Trouble is the final book in the Last Policeman Series. I reviewed The Last Policeman and even though I read Countdown City for a Read-a-thon apparently I didn't review that one. When we last saw Henry Palace, he was heading out to find his sister in the final days of humanity. Nicki joined a cult-like group who believes the asteroid's trajectory can be changed by a mysterious scientist, but the Government is preventing it for some reason. With only days left before the asteroid's meant to hit Earth, Henry is feels the pressure to find her. Using his police skills he pursues Nicki and her people to a town in Ohio, but they don't appear to be there- or they're very well hidden. The world has changed a lot since the beginning of The Last Policemen. There is panic, there is resignation, there is fear. Henry must be wary of the people he meets along the way. The rules of civilization are no longer being followed. He doesn't know what he'll find in the towns he travels through. It's a quieter book than the first in the series. He has less contact with people now. He's focused on one mission, to find his sister. The reality of the situation finally touches Henry in a way it didn't in the first book. How will this series end? I don't want to give too much away. I can only say that it gave me a lot to think about. For RIP XII: Peril on the Screen, I watched The Silenced, a Korean movie you can find on Netflix. The movie is set in 1938 at a boarding school deep in the forest. There is something reminiscent of The Shining about the title sequence as a car winds it's way through the trees. One of the passengers is Joo-ran aka Shizuko, a new girl at the school. She's meek and sickly, struck with TB. The school's headmistress tells her they will soon cure her. She begins a medical treatment involving injections. Some of the other girls act strangely toward her. There was another student with the same name who disappeared late one night, never to be heard from again. They resent her as an apparent replacement for their missing friend. One girl takes Shizuko under her wing. Yeon-duk is an athletic girl who works hard so she can be chosen for a mysterious trip to Tokyo. She makes friends with Shizuko and they spend their time wandering around in the forest near the school. Strange things begin to happen to the other girls and eventually Shizuko herself. She and her new friend try to find out what is really going on at this weird school. It's hard to judge the quality of the acting when you don't know the language. I think the girls were fine, but some of the Baddies laid it on a bit thick. (There is one young guy, and I thought, 'Dude, less swagger.') The cinematography was beautiful, and costumes pretty great. This movie is less scary than I thought it was going to be. It's more of a mystery. There is some bizarre body horror as Shizuko is a witness to some freaky contortions by her classmates, but that's about it for scares. The Silenced was fine. Netflix suggests I watch Oh My Ghost! a series about a horny virgin ghost who possesses a chef. Um, okay? Korean horror movies are so creepy!! Just that image creeps me out. RIP XII : I'm Here For It!